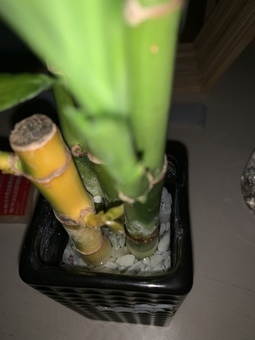 I got my lucky bamboo about 2 weeks ago, and everything was going fine until this weekend. I noticed that one of the stalks have turned yellow, but I’m not sure how or what I can do to fix it. 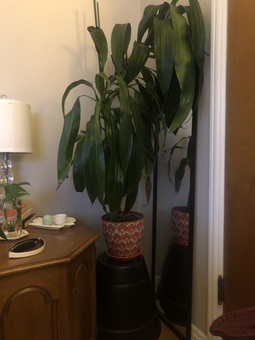 I’ve never had a lucky bamboo before, please help me!!! Also the stalk isn’t rotting Andy nothing seems wrong with the structure, it’s just yellow/orange. Please help!!! Pei Hey Emily, can you share a bit more info on how much sun and water it gets? Is it rooted in soil or water?? it's difficult to identify the problem without knowing how its cared for. I posted pics of my bitten-up Alocasia leaves yesterday (which stands next to this pothos) and it was suggested spider mites. I didn't see webs, but I treated with alcohol and removed two leafs anyway. 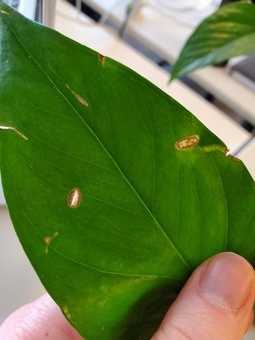 Today, I took a closer look at my pothos and discovered that many leaves have similar bites. I see no webbing but I sprayed the underside with alcohol anyway. Does anyone have any alternate theories as to what could be eating this plant? Should I keep treating with alcohol or something else? Erin Hi Sheila! 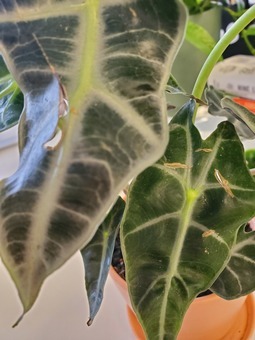 I'm not certain these are bite marks from pests - especially if your plant is kept indoors year round, and you don't see any other symptoms of common houseplant pests, like webbing and/or white mildew. It's possible these are minor leaf deformities and just normal imperfections. 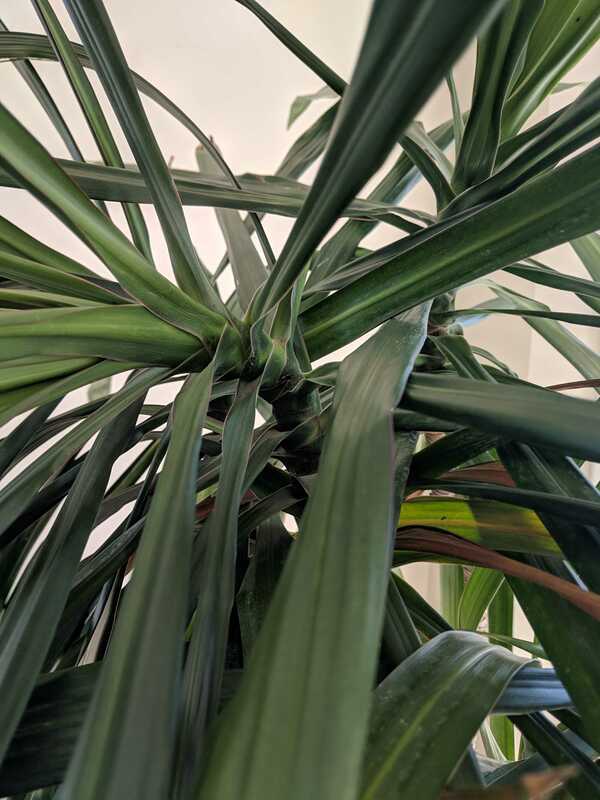 Can you post a photo of the entire plant? That would be helpful! My Peperomia plant is drooping and I’m unsure why. I watered it and let it be, it’s been drooping for awhile. Is this normal? What should I do? Pei I personally don't think planter is the issue here. I have a stilt peperomia and many plants in non-driange pots, and they are all fine. Granted it's a bit more difficult for plant beginners or novice to tell the water situation. How much water do it give it each time??? also how much sun does that plant get? PlntNrd Does that pot have drainage? And how long have you been watering weekly? So, most likely, it started dropping due to lack of water. That’s a smallish looking pot, which is means it dries out quickly, and peperomias like to dry out a bit, but will definitely droop with too little water. Now that you’re watering weekly, that’s good, but plants can sometimes take a little while to physically show evidence of how they are being cared for. Meaning it could take a little while to for it to start looking better, but, if that pot doesn’t have drainage, be very careful watering. Underwatering, then giving too much water to try to perk it up a, plus no drainage can spell disaster for any plant. 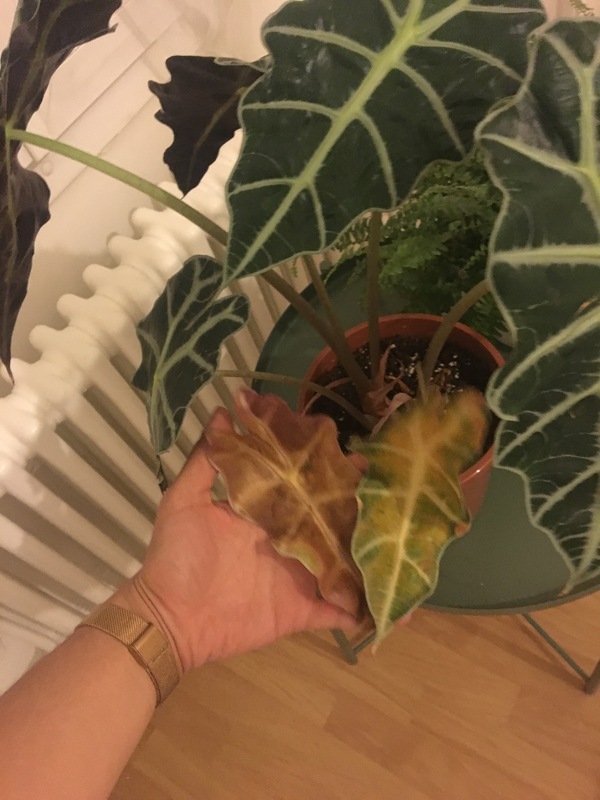 some of my Alocasia's leaves are a little beat up, is that OK? hey all! I got this 4-5 inch Alocasia Polly from the Sill about 3 months ago, I love her. I noticed when I got her that some of her leaves are a bit beat up, little tears and holes here and there - she came that way so it's nothing I've done. Is this OK? Anything I should be aware of or do? I've just started fertilizing. Maybe this is just the way the plant is. I just wanted to check and make sure it's healthy. PlntNrd If you don’t find any evidence of mites, it’s probably just mechanical damage. You did say that the tears and holes were present when you received this plant, right? So, to me, that makes me think that it was most likely due to shipping damage. The tears/holes obviously won’t repair themselves or close up, but they will heal. One thing you might want to think about is humidity levels around this plant. 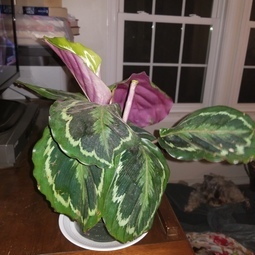 Alocasia’s like lots of humidity and the tears and holes could get worse (and more can appear) with a lack of humidity. Sheila Ack! If I find out rhat it is spider mites (when I check out the plant at the office tomorrow) should I remove the damaged leaves after treating it? Pei I suspect it's the spider mites. Do you see any "fine" webbings on the front and back of leaves? Hey there! My Alocasia is acting up again. Left him alone for 4 days and came back to this. 2 leaves are looking real sad and almost completely yellow while the rest of the plant looks okay. Are this two total goners? Any chance they may come back to life? Or better to chop them off as close to the root? Ive has this fiddle leaf fig tree for about 3 months now, have had it consistently in the same location, although with the longer days now it might be getting more sun than it did before. I tend to water it about once a week, making sure to feel the soil to see if it really needs the water or not. 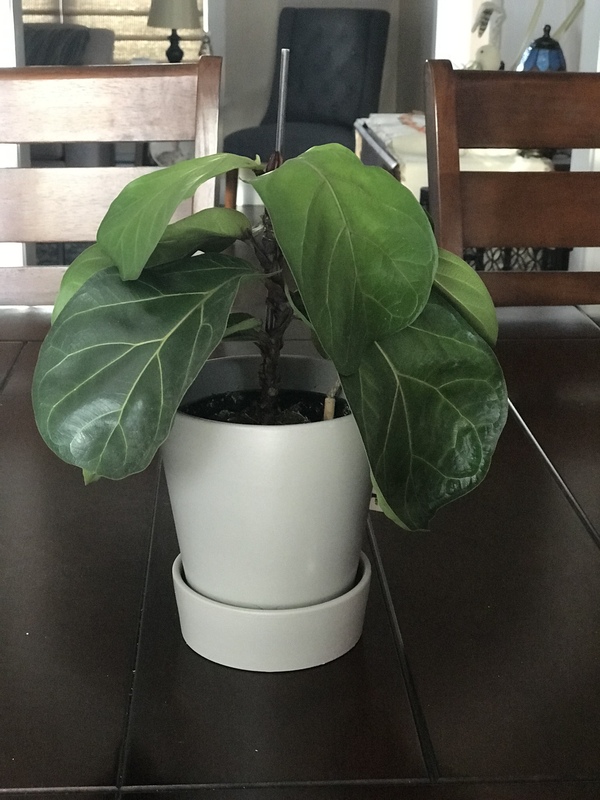 It’s started to droop and lose its leaves and I’m not sure why :( Any ideas? PlntNrd It actually looks likes it overwatered. Droopy, discolored leaves and loss of leaves that look like that are usually caused from overwatering. I’m guessing your pot has a drainage hole, but maybe once a week is still too much. How far down are you feeling the soil and how dry is it when you water? How much light is it getting too? Fiddles like lots (lots) of bright light. Like a ton. I've been rooting my monstera vines in water the past few weeks. They've been doing well, growing lots of new roots and was excited to see new leaves coming up until I saw two out of the three had black spots on them. They haven't even uncurled yet. I've changed out the water every few days with room temperature filtered water and kept them in bright indirect light. What's going on?? Pei Hmmm.... how long has it been the water again? Do you think she will make it? This 40 inch tall beauty was being reported yesterday she roots did not come up with her. She went from the black pot on the bottom to red pot on top. Do you guys t think she will survive or is she a goner? I have had since she was less that foot tall so I would be crushed to lose her but I also don’t want to watch her die. Pei [292125,Carly] What do you mean "she roots did not come up with her"? 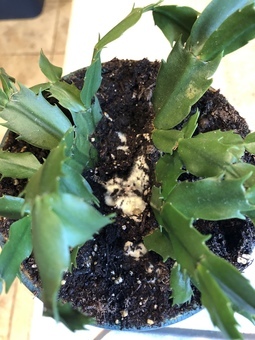 I noticed a yellowish fungus grows in the soil of my Christmas cactus. What causes it and how do i get rid of it? Luckily the fungi is is not bad for the plant ( I wrote The Sill about this same fungi a while back). If you want it gone you have to clean the pots and the roots of your plant then replace all the soil. I had this on a few of my plants and just did a huge project of reporting and cleaning the pots and plants. I will report back and let you know if it comes back in a couple of weeks. Hilary Johnston Hi Melissa - this looks like the cactus is getting too much water and the soil is growing mildew. Try placing this in bright light and letting it dry out - these guys don't need much water! In the meantime, I would remove the top layer of dirt and mold. Hello! 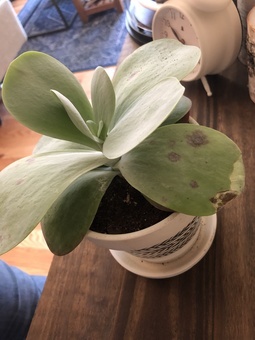 I got this flapjack paddle plant about 2 months ago and it has been developing spots which turn brown and then shrivel up. I have it in a south facing window with bright light, and water sparingly about every 1.5 weeks. No visible signs of pests, and in well-draining soil and pot. Any thoughts? PlntNrd It could be edema or corking. Even though you feel that water it sparingly, and only every 1.5 weeks, that could still be too much. I only water my succulents every 3 weeks. Depending on your environment, it may just not need that much water. 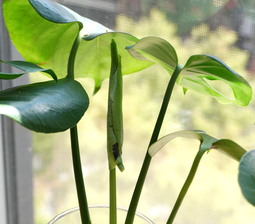 Try waiting until you see the leaves actually get wrinkled before you water again next and see how that takes. Hi plant parents! 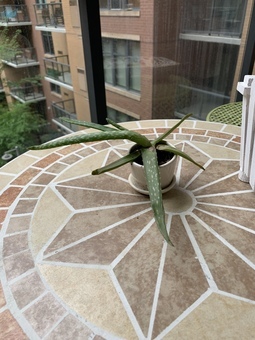 I’m new here, and my aloe looks very unhappy. I keep him on my balcony where there’s not a ton of sunlight unfortunately, and I’m watering him every other week ish. Is that too much? Does he hate me? Pei it has been overwatered. Aloe likes bright full sun to indirect bright light. I think once every three weeks or once a month water is more then enough. I will suggest to take the plant out and examine the roots carefully. and if it looks black and brownish, i would clean up the rotted ones and resoil it to help it have a second chance! PlntNrd It definitely looks like it is overwatered. Does that pot have a drainage hole in it? Every other week might just be too much for this plant in the conditions it’s in. Only water when the soil is totally totally dried out, and even then, wait a little bit. I have a draecana 'tarzan' that's been doing quite well. However, I just noticed that with all the new growth at the top the crown is folded and leaning at an almost 90° angle. Worried it's close to snapping. I assume my options are either staking or pruning the crown but not sure what the best option is and if there are any trade-offs. 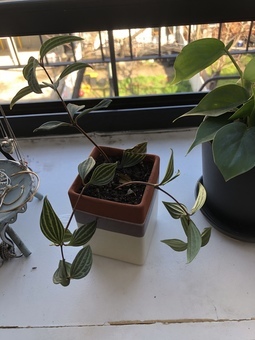 received stem/leaf with new plant - will it grow if planted? I got a new neon pothos from the Sill. There were a few "stems" in there - appeared to be cut stems with leaves on top that were not rooted and falling out. Not attached to a root at all. I put these back into the soil and packed them in. My question - will they grow roots and become part of the plant? Or eventually die? Seems like the plant had a rough delivery... Sorry I don't have a pick; I don't want to un-plant them. (There were no nodes on these stems). Pei Hey Sheila, do you have a photo? 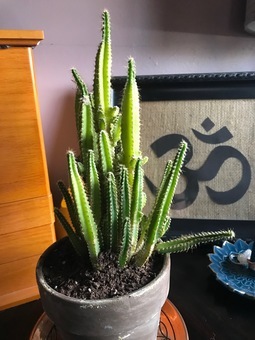 Looking for some guidance on how to help my Cactus friend here. I've had it for over six moths and things were going fine until about a month ago. I noticed the change in color and shape of each segment, but at first thought it was ok. Then the changes continued with the addition of the bottom of some segments looking dried out, and browning. I did some quick research and some resources said it could be root rot, but the narrowing of the top of the segments doesn't fit into that theory(as far as I could deduce). Now the segments are starting to fall away from the main system. Any ideas on what is wrong and how I could help my little prickly friend? PlntNrd How much light is it getting? The thinning and color change at the top is etiolation due to lack of sufficient light. It also looks like it’s in pretty wet dense soil. Pei Is it mushy to touch?